The Toyota Avalon (トヨタ・アバロン, Toyota Abaron) is a full-size car produced by Toyota. It is Toyota's largest front-wheel-drive sedan and serves as its flagship vehicle in the United States, Canada, Puerto Rico, and the Middle East. It was also produced in Australia from April 2000 until June 2005, when it was replaced in November 2006 by the Toyota Aurion. The first production Avalon rolled off the TMMK assembly line in Georgetown, Kentucky, in September 1994. A second-generation model was released in the United States and Japan in 1999. Toyota marketed the Avalon as a replacement for the Toyota Cressida, a model discontinued for the American market in 1992. While the Cressida was an upper-level midsize rear-wheel-drive car with a straight-six engine, the Avalon is front-wheel-drive, powered by a V6 engine. In recent years, there has been considerable overlapping with its platform mates, the Toyota Camry V6 and the Lexus ES, although the third-generation Avalon was distinguished by offering extra legroom. Since 2013, the Avalon was introduced on a platform that is shared with the Lexus ES. Avalon is a legendary island featured in the Arthurian legend, fitting it in with Toyota's tradition of naming their sedans the word for "crown" in various languages (Crown, Corona, Camry, Corolla), types of crowns (Tiara), or other things associated with royalty (Scepter). The Avalon was a new model introduced in February 1994 at the Chicago International Auto Show and launched in late 1994 for the 1995 model year. Built in the same plant as the Camry, the Avalon was developed under the 299T program from 1990 to 1994 and based on a stretched XV10 Camry platform featuring a 3.0-liter 1MZ-FE V6 engine making 192 hp (140 kW) and 210 lb⋅ft (285 N⋅m) of torque. With almost 121 cu ft (3,426 l) of interior space, the Avalon was the roomiest six-passenger car from a Japanese manufacturer marketed in America, despite being three inches shorter than the Mazda 929 and 11 inches shorter than the Dodge Intrepid. The Avalon was available with a front bench seat for six-passenger seating, and its column shifter was the first such feature in an American Toyota car since the 1982 Corona. The XL models were similar to the LE models of other Toyota vehicles, and the XLS models were similar to the XLE models of other Toyota vehicles. Traction control was optional. For 1997 models ABS became standard, power rating increased to 200 hp (150 kW), and torque increased to 214 lb⋅ft (290 N⋅m). In 1997 for the 1998 model year a mid-cycle refresh was introduced with minor updates to the front and rear fascias. Also for 1998, the Avalon's structure was modified to improve safety while front seat-mounted side airbags became standard. The first-generation Avalon was also sold in Japan (vehicles were made in the United States and exported to Japan) as a right-hand drive model, and was exclusive to Toyopet Store locations. 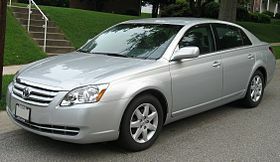 In Japan, it was the largest front-wheel drive sedan at Toyopet Store locations, and was sold alongside the front-engine, rear-drive Toyota Celsior, and was available in 3.0 and 3.0G grade levels, with the "Coach Edition" available as an option starting in late 1997 (equivalent to the 1998 model year). In Japan it was considered a luxury car due to its exterior dimensions placing it in the "large car" category according to Japanese Government dimension regulations and the engine displacement obligating an expensive, yearly road tax. In 1999, Toyota transferred the old tooling for the Avalon to Toyota Australia, which launched this Avalon as an "all-new" model in June 2000. The new Australian Avalon had an identical body to the original 1994 Avalon. The Australian model was built in the Melbourne suburb of Altona, made in both right-hand drive (for Australia, New Zealand, and some parts of Asia), as well as left-hand drive for the Middle East. The Camry was also made at this plant. The Avalon performed poorly in Australia; critics called the car "boring", and sales were low. The Avalon was front-wheel drive and available only as a sedan with a 3.0-liter V6 and automatic transmission. By contrast, its intended rivals, the Ford Falcon and Holden Commodore, were rear wheel drive and offered a wider range of body styles and engine/transmission options. Toyota had originally decided to rename the Avalon as the Centaur for the Australian market, named after the mythological creature of the same name. The same name was also used by the AHS Centaur, an Australian hospital ship that was torpedoed and sunk by a Japanese submarine during World War II. When Toyota Australia was made aware of this prior to the release of the car, they organised for the Centaur badges to be destroyed and removed the offending nameplate from all paperwork and advertising. As a result, the original "Avalon" name prevailed for the Australian market. When the Avalon was updated in 2001 as the "Mark II" (not to be confused with the separate Toyota Mark II), the model range was lightly revised and new hubcaps/alloy wheels were fitted. The "Mark III" designation refers to the 2003 to 2005 facelift models. Many buyers preferred the V6-powered Camry instead of the Avalon, and the 2003 facelift failed to rectify the lower than expected sales, with many criticizing the new front styling. Because of these sales concerns, Toyota Australia marketed it towards taxi fleets, against the Ford Falcon, with a specially developed dual-fuel (LPG and gasoline)-compatible engine. Avalon production ceased in mid-2005. In November 2006, Toyota introduced its replacement, the Toyota Aurion (XV40). At the 2003 Melbourne and Sydney International Motor Shows, Toyota Australia unveiled the X-Runner Concept, a coupe utility version of the Avalon. The suspension AWD parts were borrowed from the contemporary Lexus RX. It was intended for production, but Toyota of Australia could not get approval from the parent company. The second-generation Avalon grew larger in almost every respect, except wheelbase. It was still based on the stretched Camry platform and was powered by a 3.0-liter 1MZ-FE V6 engine equipped with VVT-i, shared with the Toyota Sienna, Lexus RX300, Lexus ES, and the Toyota Highlander, making 210 hp (157 kW) and 220 lb⋅ft (298 N⋅m). of torque and paired to a 4-speed automatic. The coefficient of drag had been reduced to Cd=0.28. This second-generation Avalon also featured a built-in 115 V AC power inverter, the first car with such a feature. This was dropped in the third-generation Avalon; yet, the Toyota Matrix, Sienna, and Scion models now offer such an inverter. This second-generation Avalon was also exported to the Japanese market as the Toyota Pronard, derived from the French word "prôner" for "extol", "commend", or "praise", between 2000 and 2004, replacing the first-generation sold as the Avalon. The Japanese Toyota Pronard was reassigned from Toyopet Store and was now exclusive to the former Vista Store network as Toyota Netz Store locations, slotted between the larger Toyota Aristo and smaller Verossa and Altezza. Some of the optional equipment installed in the Pronard, to enhance its luxury, was the TEMS ride control technology. Due to poor sales, Toyota did not export the third-generation Avalon to Japan; thus, the Toyota Pronard has been discontinued. In the Insurance Institute for Highway Safety (IIHS) frontal crash test the Avalon received a "Good" overall score with the "Good" in all six measured categories. There was no Australian production or sales of this or later models. The Avalon was the first Toyota to use Dual VVT-i in the US market in an all-new 3.5-liter 2GR-FE V6 engine which met ULEV certification and had a power output of 280 hp (209 kW) with a 0–60 time of 6.0 seconds. The engine was mated to a 5-speed sequential shift automatic. Due to changes in the SAE's testing procedures, power dropped to 268 hp (200 kW) and torque dropped to 248 lb⋅ft (336 N⋅m) for the 2006 model year. Actual power output did not change. The Avalon came in four trims: the standard (base) XL, Touring, XLS, and Limited. The XL model included 16" alloy wheels, while other trims came with larger 17" wheels. Performance-oriented tires were fitted to the Touring and Limited trims. The XL included dual-climate automatic temperature controls and steering wheel-mounted audio and climate controls. The Touring trim offered faux aluminum and all-black leather interior, a sport-tuned suspension, unique powder-coated gray wheels, and a trunk lip-mounted spoiler. The XLS introduced standard cargo nets, six-disc CD changer, a power sliding-glass moonroof, electrochromic auto dimming rear-view and driver's side-view mirrors, four-way passenger power seat and a HomeLink transceiver. The high-end Limited trim offered air-ventilated seats with a power driver's seat cushion length adjuster, Toyota's Smart Key System with keyless push-button start and entry, a quieter acoustic windshield, rain-sensing windshield wipers, an upgraded 12-speaker JBL audio system, "in-glass" LED turn signals on the side mirrors and a wood-trimmed steering wheel and shift gear lever. A navigation system was optional for every trim level other than the XL version. The Avalon had a flat rear floor design and reclining rear seats. Vehicle Stability Control was optional on all trim levels. Other options included a keyless Remote Engine Start, rear window power sunshade and, on Limited models, a Dynamic Laser Cruise Control system. HID lighting with auto-leveling was standard on Touring and Limited grades. For the 2006 model year, Toyota expanded the availability of Vehicle Stability Control to XL and Touring trim levels. The 2007 model year had the tire pressure monitoring system standard across all trims and the navigation system made optional for the Touring trim level. The 2008 model year Avalon released in 2007 received a mild facelift. Rear taillights received subtle tinting, and the front fascia was redesigned. Other changes included a six-speed automatic transmission, chrome exterior door handles for the "Limited" trim, restyled alloy wheels for the "Touring" and "XLS" trims, a built-in remote key, upgraded rear brakes, and Bluetooth integration with all JBL Synthesis audio systems. "Touring" models received a color-keyed grille, "XLS" and "Limited" models had a chrome grille, and all models included an in-dash six-CD changer. The 2009 model year Avalon offered a few changes: Vehicle Stability Control [VSC] became standard on all trim levels, and the Touring version was no longer offered. XLS and Limited leather seats now offered a Dark Charcoal color, and the Indigo Ink Pearl exterior color was replaced with Cocoa Bean Metallic. The 2010 model year offered two updates: all passenger windows received an automatic up/down function, as opposed to just the driver and front passenger's side, and a new accelerator pedal was redesigned. The Avalon went on sale in April 2010, for the 2011 model year, with revised styling and only two trim lines: a base Avalon model and a more upscale Limited trim. A backup camera became standard using either the rear view mirror or navigation screen for a display, and exterior side mirrors with integrated turn signals now folded in. The updated navigation system now had real-time traffic updates. Other changes included a redesigned instrument cluster and center console, new wood-style trim, new sheetmetal, and a different rear and front fascia design. The front and tail lights included LED piping, and fuel economy was slightly improved to an EPA-estimated 20/29/23 (city/highway/combined) mpg rating. The revised Avalon had a new brake-override control. It had an improved suspension system and a 12-speaker JBL Synthesis system which was only available on the Limited trim. 17" wheels were also standard on both trims although the Limited model has 10 spokes. Other exterior differences on the Limited included HID projector headlamps. The Avalon came standard with anti-lock brakes, electronic brakeforce distribution, brake assist, dual front airbags, front row side torso airbags, front and rear side curtain airbags, and a driver's knee airbag. For 2009 models Vehicle Stability Control, traction control became standard while active head restraints were added. In 2010, the Star Safety System was added for the 2011 model year. The Avalon was subject to the 2009-10 Toyota vehicle recalls. 2011 and later model years come standard with a brake-override system. The Avalon received a "Good" overall score in both the Insurance Institute for Highway Safety (IIHS) frontal offset and side impact tests. In 2009, with the new head restraints the IIHS awarded the Avalon its Top Safety Pick accolade. A "Good" rating in IIHS the roof strength test IIHS earned the 2011 model year the organization's "Top Safety Pick 2010" designation. The 2011 model year also received the "Top Safety Pick 2011" recommendation. Car and Driver, which had called previous Avalons "Japanese Buicks," rated it at the top of a group of large premium sedans in 2005. Edmunds.com, Motor Trend and Automobile Magazine also rated it top in their own comparisons. Consumer Reports rated the Avalon at the top of its tested group in the large and upscale category, scoring ahead of five other sedans in the January 2010 issue. In 2010, the 2011 model year Avalon competed against the Ford Taurus and received first place awards from Motor Trend. The hybrid gasoline-electric model of the 2013 model year Avalon uses the revised version of Toyota's Hybrid Synergy Drive power train, similar to the one powering the 2012 model year Camry Hybrid. The U.S. Environmental Protection Agency rated the Avalon Hybrid as 40 mpg‑US (5.9 L/100 km; 48 mpg‑imp) on combined cycle, 40 mpg‑US (5.9 L/100 km; 48 mpg‑imp) on city, and 39 mpg‑US (6.0 L/100 km; 47 mpg‑imp) on highway driving. The hybrid version went on sale in the United States in December 2012. The Avalon Hybrid comes with a 2.5 L inline-4 engine. When combined with the electric motor the system has a total output of 200 bhp (149 kW). The Avalon Hybrid uses a 1.6 kWh sealed nickel-metal hydride traction battery, the same as the Camry Hybrid. The 2013 model year TRD Edition is a concept car developed by Toyota Racing Development. It includes a supercharged 3.5-liter V6 engine with Eaton Gen 6 TVS rotor assembly, six-speed automatic transmission, six-piston front & four-piston rear calipers, burgundy body color, tinted taillights, color-keyed grille and dual exhaust with polished mufflers, 19-inch wheels with Michelin 225/40R19 tires, a red stitching touch on the instrument and door panels, seats red stitching and accent piping and a JBL GreenEdge surround-sound system. The 2013 model year HV Edition is based on the hybrid model. It includes 19-inch wheels with Michelin Pilot Super Sport 225/40R19 tires, JBL GreenEdge surround-sound system with 15-speakers, hybrid-blue headlights, turn signals, bright white with electric blue body color and the suspension and braking system from the 2013 model year TRD Edition. The 2013 model year DUB Edition includes 22-inch-deep concave custom made satin black TIS wheels with Pirelli tires, lower sport suspension, custom body kit, tinted windows, taillights, emblems and plush diamond patterned suede seats. It was built by DUB Magazine. In 2015, for the 2016 model year, the Avalon received a facelift which was first shown at the February 2015 Chicago Auto Show. Changes include a new front grille, updated suspension to improve ride comfort, revised wheel designs, and standard Toyota Safety Sense P.
The redesigned fifth-generation Avalon debuted at the January 2018 North American International Auto Show in Detroit, and went on sale in the US in May 2018. It rides on the TNGA platform, whose 113-inch wheelbase is shared with the 2019 model year Lexus ES (XZ10). It has two Toyota firsts: Apple CarPlay (Android Auto is not offered) and an optional adaptive suspension found in the Touring trim. Two engine choices, shared with the Toyota Camry, are offered: a 3.5 L 2GR-FKS V6 with 301 hp (224 kW), and a hybrid powertrain consisting of a 2.5 L 176 hp (131 kW) A25A-FXS I4 coupled with a 118 hp (88 kW) electric motor; combined power output is 215 hp (160 kW). The hybrid is set up similarly to the redesigned Camry hybrid with a NiMH battery pack, though unlike the Camry hybrid, a li-ion battery is not offered. The EPA rated the V6 at 22 mpg‑US (11 L/100 km; 26 mpg‑imp) on city, 32 mpg‑US (7.4 L/100 km; 38 mpg‑imp) on highway driving, and 25 mpg‑US (9.4 L/100 km; 30 mpg‑imp) on combined cycle. The Avalon Hybrid is rated up to 43 mpg‑US (5.5 L/100 km; 52 mpg‑imp) on city driving and 44 mpg‑US (5.3 L/100 km; 53 mpg‑imp) on both highway driving and combined cycle. ^ "Toyota Large Sedans". US Environmental Protection Agency. Retrieved 2018-07-05. ^ a b c d "A look at Toyota's 25 years in Kentucky". KyForward. Lexington, Kentucky. Archived from the original on 2014-11-12. ^ "Take Me to an Elks Lodge and Don't Step on It". The New York Times. 2010-07-23. ^ a b Nordlicht, Donny (2012-04-04). "New York 2012: Lexus Reveals 2013 ES, New Hybrid Variant". automobilemag.com. Retrieved 2013-05-27. ^ "Overview of Overseas Production Affiliates: Oceania". Toyota Motor Corporation. 2012. Retrieved 2014-07-11. ^ "ニューモデル速報 すべてシリーズ 第163弾" . モーターファン (Motor Fan). 163. 1995-06-19. ^ Johnson, Richard (1994-05-02). "Toyota Stresses 4-Year Ccycle : 31 New Models in Next 3 Years". Automotive News. US. Retrieved 2018-05-26. ^ a b Chappell, Lindsay (1994-06-13). "Toyota's Big, New Avalon Asserts Its Citizenship". Automotive News. Retrieved 2016-10-26. ^ "Toyota Unveils Avalon, Tercel for '95". Automotive News. 1994-10-03. Retrieved 2016-10-26. ^ Edgar, Julian (2000-10-03). "New Car Test – Toyota Avalon Grande". AutoSpeed. Web Publications. Retrieved 2007-10-26. ^ Clarkson, Mark. "Toyota Avalon: Toyota's Flagship". How-to.com.au. Archived from the original on 2012-09-05. Retrieved 2007-10-26. ^ "NRMA Car Review – Toyota Avalon CSX". NRMA. Archived from the original on 2008-03-14. Retrieved 2007-10-26. ^ Gover, Paul (2010-05-27). "Cars play name game". CarsGuide. Archived from the original on 2017-04-06. ^ "Toyota Avalon (MCX10R Avalon MK1/MK2)". GoAuto. Retrieved 2010-11-28. ^ "Toyota Avalon (MCX10R Avalon MK3)". GoAuto. Retrieved 2010-11-28. ^ Mewton, Bruce; Pettendy, Marton (2003-10-14). "First drive: Avalon upgrade a techno treat". GoAuto. Retrieved 2007-10-26. ^ "Avalon taxi pioneer increases fleet" (Press release). Australia: Toyota. 2004-06-15. Retrieved 2007-10-26. ^ Pettendy, Marton (2005-03-24). "Avalon to retire". GoAuto. Retrieved 2007-10-26. ^ "Toyota Launches Aurion V6 Large Car". WebWombat. 2006-10-18. Retrieved 2007-10-26. ^ Gardner, Daniel (2017-05-03). "Australia's best concepts: 2003 Toyota X-Runner". Which Car. Australia. Retrieved 2019-02-07. ^ "Automobile US D421934 S". Retrieved 2014-07-04. ^ Rechtin, Mark (1999-10-04). "Redesigned Avalon is smoother, quieter". Automotive News. Retrieved 2014-07-04. ^ "IIHS-HLDI: Toyota Avalon". Iihs.org. 2006-04-10. Retrieved 2009-07-04. ^ Jensen, Cheryl (2005-03-20). "What Rising Young Designers Have Up Their Sleeves". The New York Times. Retrieved 2014-07-04. ^ a b "The Sensational New 2013 Toyota Avalon Makes World Debut at the 2012 New York International Auto Show" (PDF). Press release (Press release). US: Toyota. 2012-04-05. Retrieved 2012-04-11. ^ "2005 Toyota Avalon – Review". Motor Trend. Retrieved 2012-04-08. ^ "2006 Toyota Avalon". Edmunds.com. 2010-03-09. Retrieved 2012-04-08. ^ "2007 Toyota Avalon". Edmunds.com. Retrieved 2012-04-08. ^ "Toyota Vehicles : Toyota Reveals Redesigned 2011 Avalon at Chicago Auto Show / Toyota" (Press release). US: Toyota. 2010-02-10. Archived from the original on 2010-04-17. Retrieved 2010-04-27. ^ "IIHS-HLDI: Toyota Avalon". Iihs.org. 2008-11-25. Retrieved 2009-07-04. ^ "Roof strength evaluations: Large family cars". Iihs.org. Archived from the original on 2010-11-05. Retrieved 2010-11-28. ^ Bedard, Patrick; Russel, Jeffrey. "2005 Buick Lacrosse CXS v 2005 Chrysler 300 Touring v 2005 Ford Five Hundred Limited v 2005 Kia Amanti v 2005 Nissan Maxima 3.5SE v 2005 Toyota Avalon Touring Sedan – Comparison Tests". Hachette Filipacchi Media U.S., Inc. Retrieved 2007-10-26. ^ "2005 Full-Size Sedan Comparison Test". Edmunds.com. 2005-03-28. Retrieved 2009-07-04. ^ "Fullsize Sedan Comparison Ratings & Winner". Motor Trend. 2007-02-26. Retrieved 2009-07-04. ^ "2005 Chrysler 300, Ford Five Hundred, and Toyota Avalon Compared Opinions – Automobile Magazine". Automobilemag.com. Retrieved 2009-07-04. ^ "Toyota Avalon Tops in Tests of Large and Upscale Sedans: Consumer Reports". Pressroom.consumerreports.org. Archived from the original on 2010-10-31. Retrieved 2010-04-27. ^ "Kevin Hunter" (Press release). US: Toyota. Retrieved 2016-10-24. ^ Paukert (2012-06-26). "Toyota Avalon gets 40-MPG hybrid model for 2013". Retrieved 2012-08-16. ^ Philippe Crow (2012-10-31). "Prices And Specs Announced For Toyota Avalon Hybrid". HybridCars.com. Archived from the original on 2012-11-02. Retrieved 2012-11-02. ^ "Toyota Avalon Performance and Specs". US: Toyota. 2012-11-30. Retrieved 2012-11-30. ^ Josh Pihl (January 2014). "Table 33. Batteries for Selected Hybrid-Electric Vehicles, Model Years 2013-2014". Oak Ridge National Laboratory. Archived from the original on 2014-11-29. Retrieved 2014-11-21. ^ "DUB & Toyota team up for a 2013 DUB Edition Avalon at SEMA". DUB. 2012-10-25. Retrieved 2012-11-01. ^ Bayu Permadi Sasmita (2012-10-25). "2013 Toyota Avalon Concept (Tuned Version) Headed to SEMA". The Car Driving. Archived from the original on 2013-02-04. Retrieved 2012-11-01. ^ Ross, Jeffrey (2012-10-26). "Toyota shows more SEMA stuff, including sportier Avalons that may preview production model". Autoblog. Retrieved 2012-11-01. ^ "2015 Chicago Auto Show – 2016 Toyota Avalon Reveal" (Press release). US: Toyota. 2015-02-12. Retrieved 2015-04-08. ^ "Attainable Premium, Actualized: All-New 2019 Toyota Avalon Beams Effortless Sophistication, Style, and Exhilaration at the 2018 North American International Auto Show" (Press release). US: Toyota. 2018-01-15. Retrieved 2018-05-26. ^ "一汽丰田AVALON名亚洲龙 广州车展首发" [FAW Toyota Avalon named as Asia Dragon at Guangzhou Auto Show]. Pacific Auto Network (in Chinese). China. 2018-11-12. Retrieved 2018-11-18. ^ a b "Attainable Premium, Actualized: All-New 2019 Toyota Avalon Beams Effortless Sophistication, Style, and Exhilaration at the 2018 North American International Auto Show" (Press release). US: Toyota. 2018-01-15. Retrieved 2018-01-16. ^ Ramey, Jay (2018-01-16). "2019 Toyota Avalon and Hybrid debut at Detroit Auto Show: Gallery, specs and trim features". Autoweek. US. Retrieved 2018-01-30. ^ "Apple's CarPlay is finally coming to Toyota and Lexus vehicles". The Verge. Retrieved 2018-10-22. ^ "2018 NAIAS: New Toyota Avalon gains advanced suspension, lighting systems". www.sae.org. Retrieved 2018-10-29. ^ "2019 Toyota Avalon Hybrid". Car and Driver. Retrieved 2018-10-22. ^ "2019 Toyota Avalon First Look". US: Kelley Blue Book. 2018-01-15. Retrieved 2018-01-16. ^ "New 2019 Toyota Avalon hybrid boosts fuel economy 10% to 44 mpg combined". Green Car Congress. Retrieved 2018-10-29. ^ a b "2019 Toyota Avalon". IIHS. Retrieved 2018-10-29. ^ a b Mike Covello: Standard Catalog of Imported Cars 1946–2002. Krause Publications, Iola 2002. ISBN 0-87341-605-8, p. 780–85. ^ "Toyota Announces Best Sales Year in Its 46-Year History, Breaks Sales Record for Eighth Year in a Row". Theautochannel.com. Retrieved 2010-04-27. ^ "Toyota Reports 2005 and December Sales". Theautochannel.com. 2006-01-04. Retrieved 2010-04-27. ^ "Toyota Reports 2007 and December Sales". Theautochannel.com. 2008-01-03. Retrieved 2010-04-27. ^ a b "Toyota Reports December 2009 and Year 2009 Sales". Theautochannel.com. 2010-01-05. Retrieved 2010-04-27. ^ Loveday, Eric (2011-01-05). "Toyota, Lexus hybrid sales rise in December". Autoblog.com. Retrieved 2015-04-04. ^ "Toyota | Toyota Reports December 2011 and Year-End Sales" (Press release). US: Toyota. 2012-01-04. Retrieved 2012-04-08. ^ "December 2012 and Year-End Sales Chart" (Press release). US: Toyota. 2013-01-03. Retrieved 2013-01-04. ^ a b Cobb, Jeff (2014-01-06). "December 2013 Dashboard". hybridCARS. Retrieved 2014-08-14. ^ "December 2013 and Year-End Sales Chart" (Press release). US: Toyota. 2014-01-03. Retrieved 2014-01-09. ^ Cobb, Jeff (2015-01-06). "December 2014 Dashboard". HybridCars.com. Retrieved 2015-04-04. ^ "December 2017 Sales Chart" (Press release). US: Toyota. 2018-01-03. Retrieved 2018-02-25. ^ "December 2018 Sales Chart" (Press release). US: Toyota. 2019-01-03. Retrieved 2019-01-05. ^ "Toyota Canada Inc. Records Best Year Ever with 231,646 Vehicles Sold in 2018" (Press release). Canada: Toyota. 2019-01-03. Retrieved 2019-01-19. Wikimedia Commons has media related to Toyota Avalon.